A high uric acid level (hyperuricemia) can lead to many serious health conditions. One of these is gout, which is a common and painful form of arthritis that affects the big toe. The pain felt with gout is said to be comparable to the pain being experienced by women during childbirth. 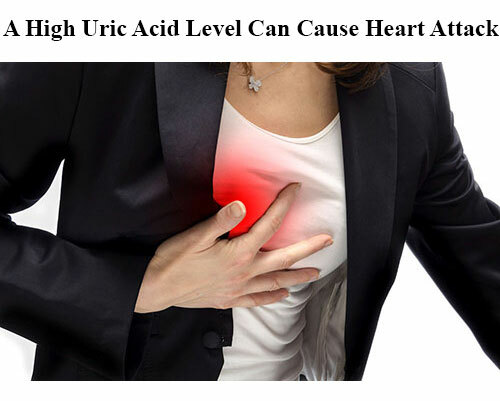 However, there are cases where a high uric acid level does not cause any pain and is asymptomatic. Therefore, if you don't go through any dietary and lifestyle changes, you can be at risk of life-threatening conditions like heart disease. In this article, we'll let you know the relationship between heart attack and uric acid and what you should do about it. 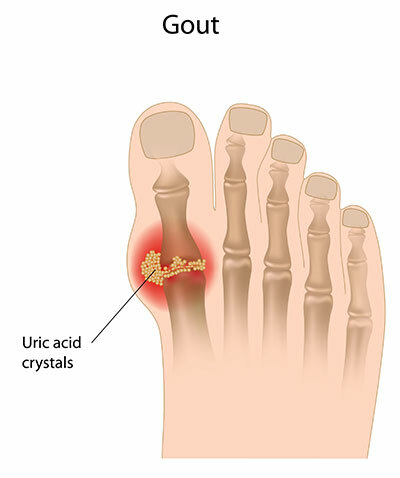 Gout is characterized by an accumulation of crystallized uric acid in the big toe or joints. This happens when your body cannot get rid of most uric acid through your urine and the normal reference value of uric acid is exceeded. These are needle-like crystallized deposits that can cause inflammation and gout pain. However, not all cases of hyperuricemia or high uric acid cause pain. Research shows that gout patients are at risk of getting heart attack even after they were treated and the symptoms disappeared. According to doctors, this is due to the fact that the uric acid level may have gotten higher again, but the patients were caught off guard since it was not accompanied by pain. In reality, this is very likely the case since there are many people who do not experience any pain despite having high uric acid levels. What is remarkable is that even people who may have a healthy lifestyle (non-smokers, non-drinkers, physically active) are at a higher risk of heart diseases for every increase in their uric acid levels. Although uric acid may look like a waste product of the body, only about 10% of it is excreted from the body. Therefore, nearly 90% of uric acid in the body is returned to the bloodstream by the kidney. This is because it was found that uric acid has a role of being a powerful antioxidant, too. In fact, more than half of the antioxidant capacity of blood plasma comes from uric acid. But even though uric acid has a vital role in the body, any excess amounts of it more that its normal reference value can be harmful to the body. In medical science, the exact cause of high production of uric acid by the body is not clearly known. However, studies show that blood vessels taking in the excess uric acid can lead to the thickening of blood vessel walls and blocks the normal passage of blood. As a result, heart attack and other conditions such as arteriosclerosis may occur. High uric acid levels may also block the production of nitrous oxide, a gas that acts as anesthesia when inhaled and allows your blood vessels to relax. Therefore, a high uric acid can also lead to high blood pressure. Watch Out! Taking Too Much Fructose Produces Purine in the Body! Uric acid is a byproduct of purine metabolism. Purine is a crystalline compound found mostly in foods of animal origin. 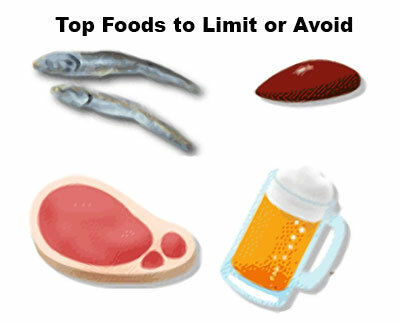 Therefore, one of the measures to take to prevent the increase in uric acid levels is to simply refrain from eating purine-rich foods such as fish roe and animal organ meats. However, there are also other important things that you should watch out for. These are foods that contain high amount of 'fructose' like sweet soft drinks. Although purine itself is not found in fructose, it will be created in the body through the breakdown of fructose. The same thing can be said with alcohol. While alcohol does not contain purine, it can increase your body's production of purine. The exact cause of gout is unknown by medical science. Even the primary cause of sudden spike in uric acid levels is usually unknown—sometimes it can still happen even if you are doing a great job in controlling your diet. That is why most treatments available today only treat the symptoms and not the cause. There are no cure available but only medications. This made me to believe that there is very strong correlation between the negative energy and these types of diseases. You may want to read the article "Root Cause of Cancer and Viral Diseases Revealed" . Gout including other similar arthritic conditions can be healed by the PYRO-ENERGEN electrostatic therapy machine very effectively. We strongly believe that the PYRO-ENERGEN can also help cases of high uric acid levels that suddenly occurred for largely unknown reasons, thereby preventing heart diseases caused by hyperuricemia. 1. "What's the Real Cause of Gout"
2. "How to Get Rid of Chronic Gouty Arthritis"